This past Tuesday, my orthopedic doctor pronounced my bones healed. All limbs, including the lagging knee, were 100% weight bearing. I was cleared to walk, drive, even ride my horse. In theory, I could throw my crutches off and sprint to the car. But, of course, there is the fine print, which reads, “as tolerated.” After 8 weeks and three days of being non weight bearing, or partially weight bearing, none of my limbs (except for my right arm, which is super strong), are really up to the task. My first steps were hesitant, awkward and brief. While delighted at the idea of being crutch and walker free, the reality of building up the strength in my atrophied legs, sank in quickly. Physical therapy is going to be a lot of work. 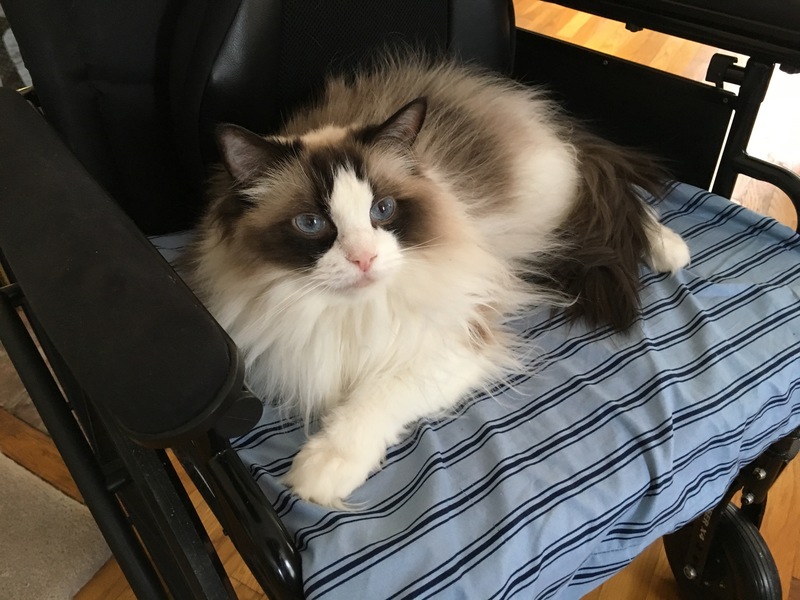 Willow is delighted that I don’t use my wheelchair much any more. It’s her favorite place to sit. This week I’ve made significant progress toward my goal of walking like a normal person and eventually being able to get back on my horse. I had one dry land PT training session, and three aqua sessions. PT in the pool is a delight. In four feet of water I can walk normally — no limping, no hesitation — and even the “work” seems easier. At least, until I get out of the water and my muscles scream with fatigue. So what if all the other folks water walking in the warm therapy pool are in their 80s, they all think I’m so young I’ll heal in no time. And water jumping jacks? Positively fun. One crutch wasn’t nearly as scary as two. Freedom almost came close enough for me to touch him today. When out and about, I still use one crutch. Fatigue sets in quickly and I can feel my legs start to shake if I push myself too hard. But around the house, I totter like a drunken sailor or a toddler, none too steady on my feet but determined to keep trying. I go a little farther each day. The crutch didn’t bother Zelda at all. She wanted a scratch on the chin and then made a concerted effort to eat my shoe lace. How long before I can ride again? Despite making a lot of progress from last week, the idea of climbing onto one of my horses with my unsteady legs, is daunting. They are fresh from the still-winter weather and have had only a few rides in the last eight and a half weeks. At this point, I wouldn’t even feel comfortable leading them into the barn, let alone riding one of them. No, at least for the time being I’m going to stick to the pool and feed them treats over the fence. Maybe then Freedom will decide that I’m not so scary. glad to hear your recovery is progressing nicely! hopefully you’ll be feeling steadier and stronger in no time flat – and perhaps just in time for spring to really settle in! I remember getting back to the barn on my crutches. Audio and Mini were terrified of them. Audio even pinned his ears! 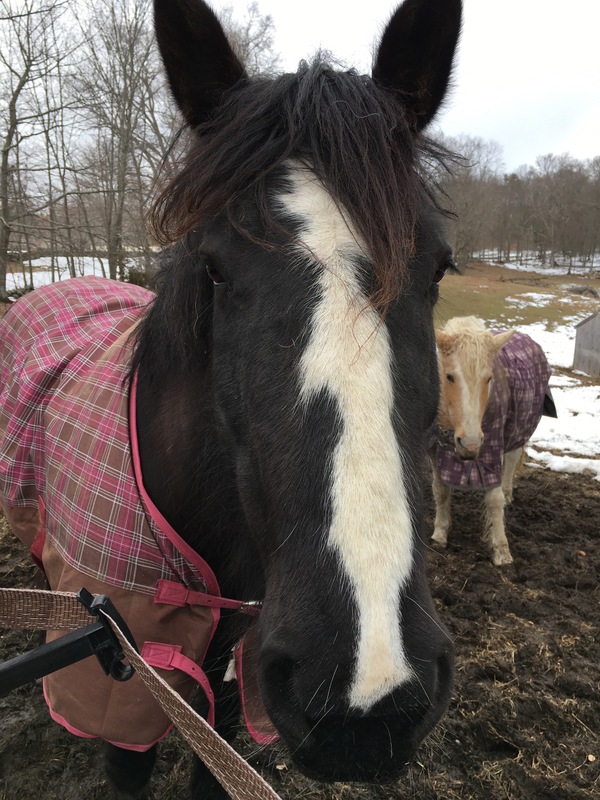 Cookies are magical in helping horses conquer their fear of the evil robotic crutches. Hopefully Freedom will get braver soon. Treats should do it. I forgot them last time. Also, one crutch is a lot less scary than two. I’m only half bionic now :). I too am glad to hear it’s going forward. Of course you’re not at full strength yet (how could you be) BUT you have the doctors ok to work towards it at your own pace. In my experience horses are a magnificent motivator to getting better. Thank you! Lunging or riding my two before I get on them is definitely on the plan. I’ve also promised the property owner that I will let them know before I try getting on again so they can make sure to look out for me! I’m thrilled for you! Take a lesson on the steady horse. Whichever. I only ride with someone around and I tittle too. When you walk ask.your pt jow to do it right. After breaking my hip, in the beginning I did it right but the arthritis on my knee has made it sore. So I need to learn to walk correctly. So learn from me! Excellent idea. I’m planning to ease back slowly, have someone else ride and/or lunge my horses first, and start with a horse that I know won’t get silly. I certainly don’t want to end up back at the beginning of the recovery process! Take your time getting back to riding. Warmer weather will be your friend and the stronger you are the more confident you will feel. Maybe add in some super simple yoga or core work for extra fitness as you get closer to riding? Glad you are recovering well, able to get around a bit easier, and have sight of getting back to normal life this spring/summer! I always remind myself that we used to give horses the winter off and it didn’t do them any harm. And we still have snow on the ground here so winter isn’t over! I’ve been cleared to water aerobics (modified) by my PT and so I’m going to start that this weekend. I realize that the mechanics of getting on and off my horses (especially, dismounting from Zelda) are beyond me at this point, even though I’d probably be fine when I was on her. As for yoga? That’s something I aspire to start again. I’m not sure I could stand up again if I sat on the ground. Better to test that first at home! What a challenge coming back from orthopedic injuries and forced inactivity. I would only be repeating what others have said, and you know, but as the weather warms and time passes you will inevitably be stronger. Bad weather, endless mud, illness, and too much work have kept me grounded this winter. 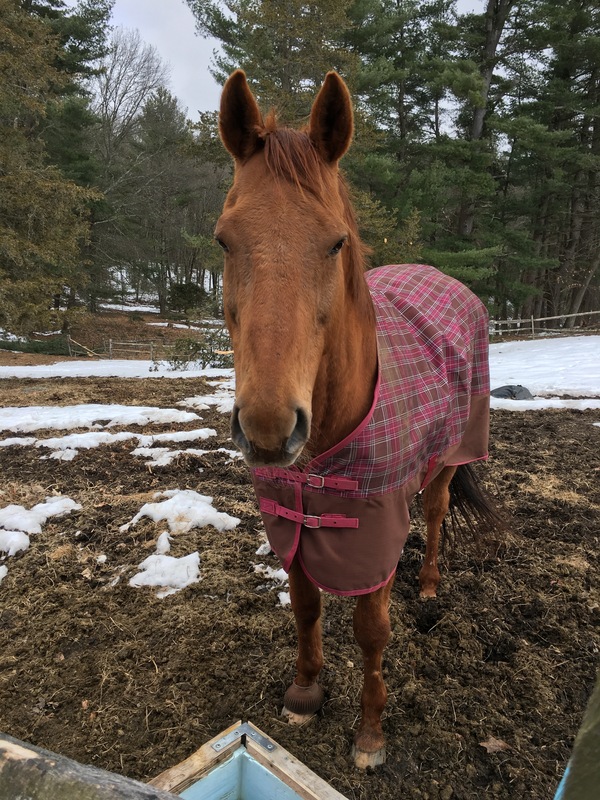 Today Frannie basked in the sun while I scraped layers of caked mud from her fat, furry body, me dreaming of trail rides and her wishing the carrot chunks in my pocket would work themselves free if she wiggled her lips just so. We bond with them on the ground too. Here’s to you getting better and stronger along with the sun. The mud is the worst ever. I hope the weather does improve. I’d love to clean my boots! !